This was such a great read. I think teens will love it too, maybe even more than an adult audience. This isn't your typical Zombie apocalypse end of the world novel. This is zombie romance. I absolutely adored R, he was such a romantic, even when he was eating brains and other body parts. It was very interesting diving into R's mind, because you got to not only see his desire to be human, but his urges that he has a hard time controlling. Julie was a fantastic character too. Very realistic. The dynamic between the two was quite humorous at times. You can tell that after a day or so, Julie did not see R as a threat, so would freely reprimand him and make fun of him. Julie was such a spark of a girl and just a free thinker, which I imagine can crop up in a society such as this and with a father like hers. One thing that did bother me in this novel, were the voices that R started hearing. I couldn't tell if they were voices he was picking up from good hearing sometimes, voices in his head or logical voices from a deeper connection. It was all a bit vague and at times I just assumed R was losing his mind, or dreaming. I would have liked that explained a little better. 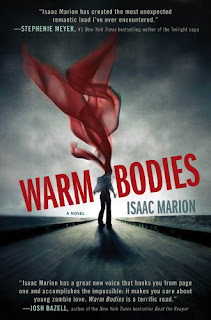 I will definitely have to keep an eye out for Isaac Marion; not only did he create characters I cared about in a very realistic world, but his writing was beautiful. He captured the romanticism of R's voice even if the actual sound of his voice was croaky and distant. I haven't read many zombie books, but I don't think there are many out there like this one, that offers you a chance to be overwhelmed with compassion for the main, walking dead, character. "I am dead, but it's not so bad." "I crush her against me. I want to be part of her. Not just inside her but all around her. I want our rib cages to crack open and our hearts to migrate and merge. I want our cells to braid together like living thread." Great review, this books sounds great. love this review! i am really hanging out ot read this book, hey ~ most all i have heard is simialr to your thoughts. I really need to get this one! Zombie romance books usually don't work for me, but this one sounds so much deeper than that. Your favorite lines are incredible too. They make me want to swim in the book. Great review!